El salmó reial o salmó reial del Pacífic (Oncorhynchus tshawytscha) és una espècie de peix de la família dels salmònids i de l'ordre dels salmoniformes. Els mascles poden assolir 150 cm de longitud total i 61,4 kg de pes. És depredat per la perca americana, Ptychocheilus oregonensis, el llobarro atlàntic ratllat, Sander vitreus, Megalocottus platycephalus, la truita de Clark, la truita arc de Sant Martí, Salvelinus malma malma, el salmó platejat, la foca comuna i el tauró dormilega del Pacífic. Viu a zones d'aigües dolces, salobres i marines temperades (72°N-27°N, 136°E-109°W) fins als 375 m de fondària. Es troba des de Point Hope (Alaska) fins al riu Ventura (Califòrnia, Estats Units), tot i que, ocasionalment, ha estat vist fins a San Diego (Califòrnia). També és present a Honshu (el Japó), el mar del Japó, el mar de Bering, el mar d'Okhotsk i el riu Coppermine (l'Àrtic canadenc). Pot arribar a viure 9 anys. ↑ [Closa, Daniel] «Salmó transgènic». Ara.cat, 26-11-2015. ↑ 9,0 9,1 Allen, M.J. i G.B. Smith, 1988. Atlas and zoogeography of common fishes in the Bering Sea and northeastern Pacific. NOAA Tech. Rep. NMFS 66, 151 p.
↑ Eschmeyer, W.N., E.S. Herald i H. Hammann, 1983. A field guide to Pacific coast fishes of North America. Houghton Mifflin Company, Boston, Estats Units. 336 p.
↑ Fedorov, V.V., I.A. Chereshnev, M.V. Nazarkin, A.V. Shestakov i V.V. Volobuev, 2003. Catalog of marine and freswater fishes of the northern part of the Sea of Okhotsk. Vladivostok: Dalnauka, 2003. 204 p.
↑ Hugg, D.O., 1996. MAPFISH georeferenced mapping database. Freshwater and estuarine fishes of North America. Life Science Software. Dennis O. and Steven Hugg, 1278 Turkey Point Road, Edgewater (Maryland), Estats Units. Andriyashev, A.P. i N.V. Chernova, 1995. Annotated list of fishlike vertebrates and fish of the arctic seas and adjacent waters. J. Ichthyol. 35(1):81-123. Bean, T.H., 1894. Life history of the salmon. Bull. U.S. Fish. Comm. 12:21-38. Becker, L.A., Pascual, M.A. i N.G. Basso, 2007. Colonization of the Southern Patagonia Ocean by Exotic Chinook Salmon Conserv. Biol. 21(5):1347-1352. Berg, L.S., 1962. Freshwater fishes of the U.S.S.R. and adjacent countries. volum 1, quarta edició. Israel Program for Scientific Translations Ltd, Jerusalem, Israel. Brodeur, R.D. i W.G. Pearcy, 1990. Trophic relations of juvenile pacific salmon off the Oregon and Washington coast. Fish. Bull. 88(4):617-636. Coker, G.A., C.B. Portt i C.K. Minns, 2001. Morphological and ecological characteristics of Canadian freshwater fishes. Can. Manuscr. Rep. Fish. Aquat. Sci. Núm. 2554. 89p. De La Cruz-Agüero, J., 1999. A first mexican record of the chinook salmon, Oncorhynchus tshawytscha. Calif. Fish Game 85(2):77-78. Esteve, M. i D. A. McLennan, 2007: The phylogeny of Oncorhynchus (Euteleostei: Salmonidae) based on behavioral and life history characters. Copeia 2007 (núm. 3): 520-533. Healey, M.C., 1982. Catch, escapement and stock-recruitment for British Columbia chinook salmon since 1951. Can. Tech. Rep. Fish. Aquat. Sci. 1107; 77 p.
Jordan, D.S. i B.W. Evermann, 1896. The fishes of North and Middle America: a descriptive catalogue of the species of fish-like vertebrates found in the waters of North America, north of the isthmus of Panama. Part I. Bull. U.S. Nat. Mus. 47:1-1240. Jude, D.J., F.J. Tesar, S.F. Deboe i T.J. Miller, 1987. Diet and selection of major prey species by Lake Michigan salmonids, 1973-1982. Trans. Am. Fish. Soc. 116(5):677-691. Laake, J.L., P. Browne, R.L. DeLong i H.R. Huber, 2002. Pinniped diet composition: a comparison of estimation models. Fish. Bull. 100:434-447. Murua, H. i F. Saborido-Rey, 2003. Female reproductive strategies of marine fish species of the North Atlantic. J. Northwest Atl. Fish. Sci. 33:23-31. Nelson, J.S., E.J. Crossman, H. Espinosa-Pérez, L.T. Findley, C.R. Gilbert, R.N. Lea i J.D. Williams, 2004. Common and scientific names of fishes from the United States, Canada, and Mexico. American Fisheries Society, Special Publication 29, Bethesda, Maryland, Estats Units. Randall, D.J., D. Mense i R.G. Boutilier, 1987. 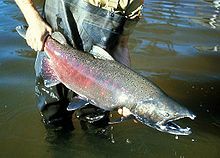 The effects of burst swimming on aerobic swimming in chinook salmon (Oncorhynchus tshawytscha). Mar. Behav. Physiol. 13:77-88. Reshetnikov, Y.S., N.G. Bogutskaya, E.D. Vasil'eva, E.A. Dorofeeva, A.M. Naseka, O.A. Popova, K.A. Savvaitova, V.G. Sideleva i L.I. Sokolov, 1997. An annotated check-list of the freshwater fishes of Russia. J. Ichthyol. 37(9):687-736. Robins, C.R., R.M. Bailey, C.E. Bond, J.R. Brooker, E.A. Lachner, R.N. Lea i W.B. Scott, 1980. A list of common and scientific names of fishes from the United States and Canada. Am. Fish. Soc. Spec. Publ. (12)1-174. Zimmerman, M.P., 1999. Food habits of smallmouth bass, walleyes, and northern pikeminnow in the lower Columbia river basin during outmigration of juvenile anadromous salmonids. Trans. Am. Fish. Soc. 128(6):1036-1054.